The world of hot pot is a divided place. 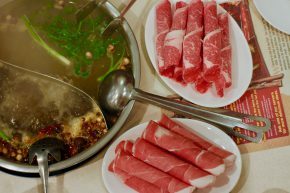 I am not simply referring to the fact that most hot pot spots support the idea of dividing the pot into two broths, but also to the fact that some offer all-you-can-eat and some go a la carte. Hot Pot Hot Pot, a ridiculously named restaurant in Monterey Park, is on the a la carte side of the pot, but I did not let this get in the way of checking the place out.